STEM for Girls is hosted by the Women's Resources and Research Center and Dr. Tina Jeoh. This program is funded by the National Science Foundation and the WRRC. 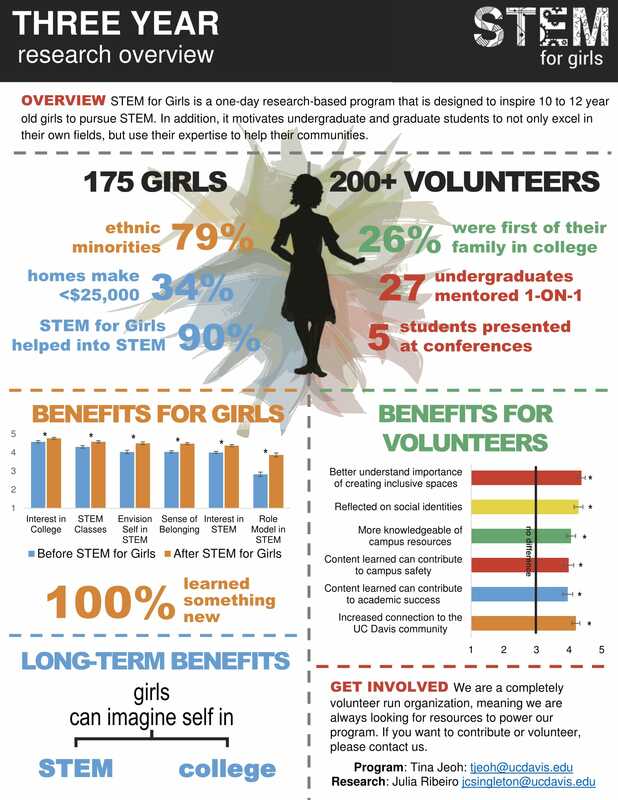 This year’s STEM for Girls event will be held on Saturday, May 11, 2019 at 10am-12pm. This is an annual program which brings local girls to the university for a day to share with them the joys of STEM. They participate in fun science-related activities, hosted by various STEM departments at Davis, and then take a tour of campus, seeing exciting STEM sites like the particle accelerator and the Bohart Museum of Entomology. AWM hosts a math workshop every year. Previous workshops have been about knot theory, where we play the human knot game and then talk about recognizing and tying various knots with bracelets and worksheets. Math students can volunteer on an individual basis, either with our department or with another. Everyone is welcome to help regardless of gender, but part of the goal of the event is also to have women in STEM as role models. Visit their website to learn more about STEM for Girls.